Represents a symbolic expression involving a binary operator. Definition at line 303 of file SymbolManager.h. Definition at line 308 of file SymbolManager.h. 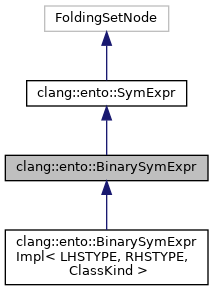 References clang::ento::SymbolRegionValue::classof(), clang::ento::Loc::isLocType(), and clang::ento::SymExpr::isValidTypeForSymbol(). Definition at line 325 of file SymbolManager.h. Definition at line 322 of file SymbolManager.h. 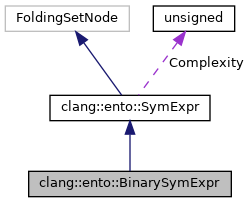 Referenced by clang::ento::SMTConv::getSymBinExpr(), clang::ento::SValExplainer::VisitSymIntExpr(), and clang::ento::SValExplainer::VisitSymSymExpr(). Definition at line 320 of file SymbolManager.h.